Mon-Fri 6:00 a.m. 5:00 p.m. Sat 7:00 a.m. 1:00 p.m. 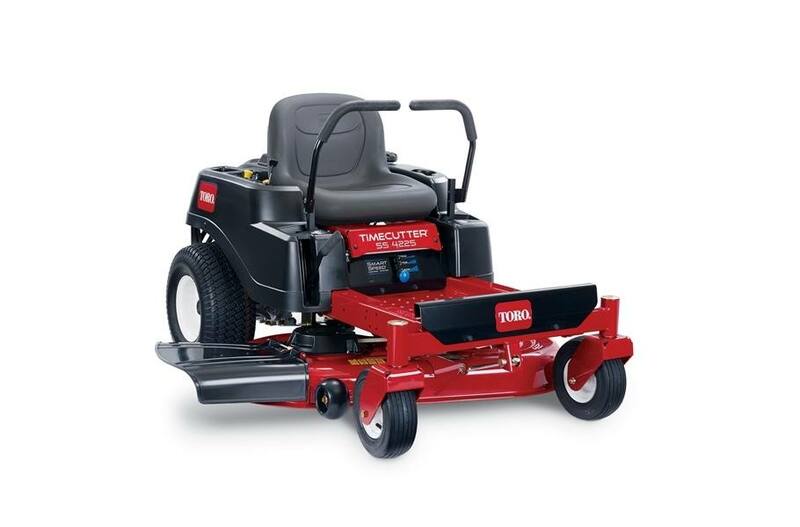 This Toro TimeCutter SS4225 zero turn riding mower is powered by a 18 hp Kawasaki V-Twin 603cc engine (CARB compliant). It features a 42", 4" deep, high capacity, 13 gauge steel mowing deck with convenient washout port and 3 gallon gas tank. Improved Cutting Quality: Redesigned deck and cutting system for the ultimate quality of cut in diverse conditions. Spreads grass up to 80% farther* for a better quality cut at a faster speed. *Results may vary based on grass conditions. Easy Switch To Mulching: Switch from side-discharge to mulching in minutes. The redesigned cutting deck and Recycler mulch kit make mowing in diverse conditions easier and faster. Better Productivity: The new bagging attachment has 29% better bag fill*, which means less stops to empty the bags. *Bag fill based on weight measured during a comparison test. Actual results likely to vary with conditions. Heavy Duty 10 Gauge Unibody Steel Frame: The lower the gauge, the thicker the metal. That is why we use heavy duty 10 gauge steel. The unibody steel frame provides the optimal balance in rigidity and flexibility for quick, highly maneuverable mowing conditions. Smart Speed® Control - Trim, Tow, Mow: Toro's Smart Speed® control system lets you choose from three ground speed ranges for optimal performance. Use low TRIM range to trim closer for maximum time savings, choose medium TOW range for towing attachments, or select high MOW range to mow large open areas and finish quickly. 3-Gallon (11.4 Liter) Fuel Capacity: All TimeCutter riding mowers feature a large 3-gallon (11.4 Liter) fuel tank for more mowing with fewer fill-ups. Knowing when to fill up is simple thanks to the translucent tank, which also helps to prevent overfilling. Save on Average 45% of your MowingTime: The Toro TimeCutter cuts your mowing time almost in half*, which means less work for you and your mower. You'll not only have more time to enjoy, you'll extend the working life of your mower. *Time savings by yard size are from 2008 - 2012 survey results for Toro residential zero-turn mowers, as reported by owners. Automatic Parking Brake: Automatically engaged when the control arms are moved outward. Simplifies operation by eliminating a separate parking brake. Heavy Duty Rear Engine Guard: This heavy duty steel guard protects the engine from branches and debris as you nimbly maneuver around your lawn. Dual Hydrostatic Drive System: Independent hydrostatic drive systems provide responsive maneuverability and zero turning capabilities. These independent drives are anchored to Toro's unibody frame and reinforced with a cross member for lasting durability and performance. Washout Ports: Deck washout ports (1 on the 32" (81 cm) and 42" (106.7 cm) decks, 2 on the 50" (127 cm) decks) create a pressure washer under your deck providing quick cleaning, maintaining optimum airflow for optimum cutting performance. 50" (127 cm) deck is pictured. Non-Slip, Easy-to-Clean Floor Pan: The pierced floor pan is perfect for homeowners who like their mower to look as nice as their lawn. Simply hose down the floor pan after each use and keep your TimeCutter looking as good as new. The non-slip pierced extrusions also provide an additional measure of safety. 3-Year Limited Warranty - No Hour Limitations: Product is warranted against defects in materials and workmanship for three years without an hour limitation. See owner's manual for complete warranty details. *The gross or net horsepower ratings of these engines were laboratory rated at 3600 rpm by the engine manufacturer in accordance with SAE J1940. As configured to meet safety, emission and operating requirements, the actual engine horspower on these mowers may be significantly lower. 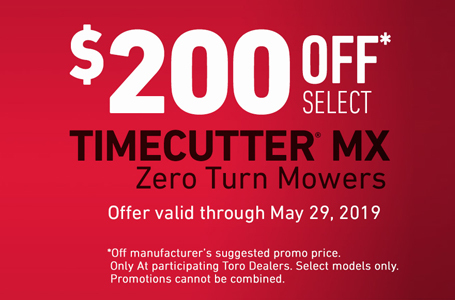 *Up to $200 off suggested promo price on select TimeCutter MX mowers. Models 74768/74778, 74774 = $200 Off and 74777 = $100 Off. 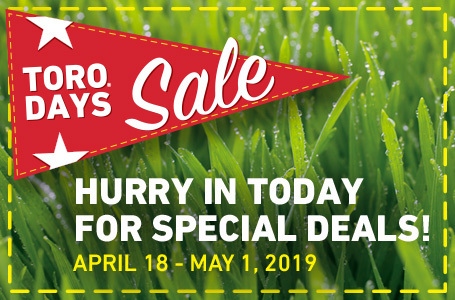 Valid on purchases made from March 29, 2019 to May 29, 2019. See participating retailers for details. Discounted Price will be shown on retailer's site. 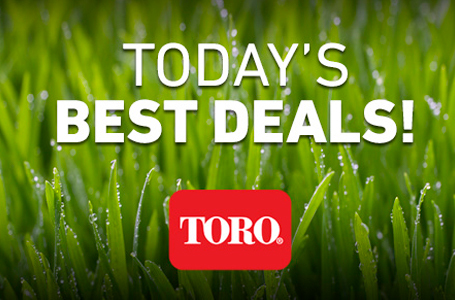 To find a local retailer, visit toro.com/retailer. 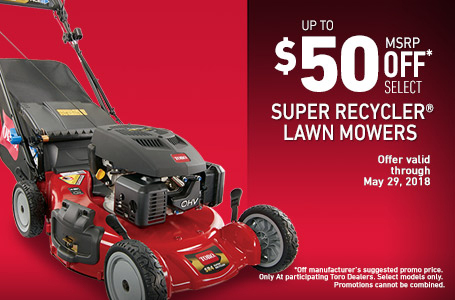 *$50 off suggested promo price on select Super Recycler Mowers. Models 20381, 21381, 20382, 20383 and 20384. Valid on purchases made from March 29, 2019 to May 29, 2019. See participating retailers for details. Discounted Price will be shown on retailer's site. 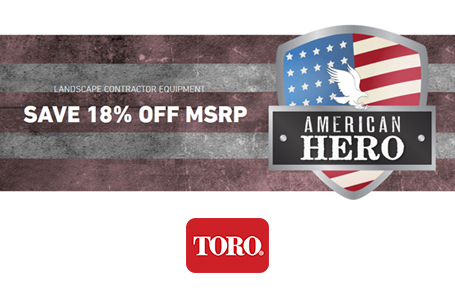 To find a local retailer, visit toro.com/retailer. 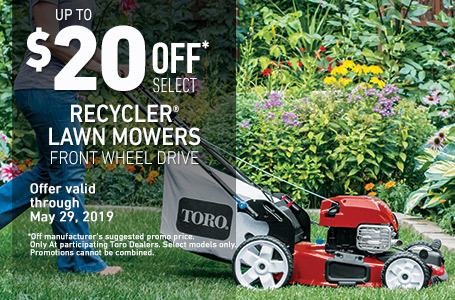 *$20 off suggested promo price on select Recyclers Mowers. Models 20339, 20378 and 20379. Valid on purchases made from March 29, 2019 to May 29, 2019. See participating retailers for details. Discounted Price will be shown on retailer's site. 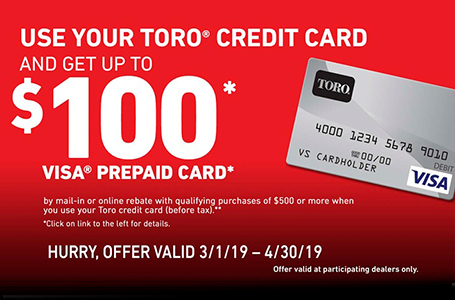 To find a local retailer, visit toro.com/retailer. Mon-Fri: 6:00 a.m. - 5:00 p.m. Sat: 7:00 a.m. - 1:00 p.m.